The Idolmaster Hoshii Miki Yukata Ver. 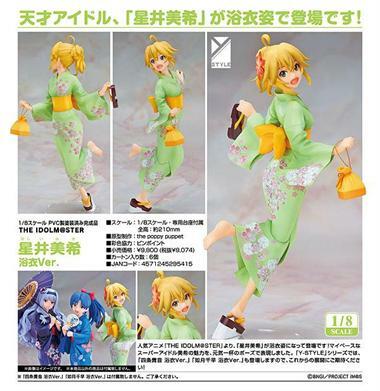 From the popular anime series 'THE IDOLM@STER' comes a figure of Miki Hoshii wearing a yukata! The super idol that always takes things at her own pace has been sculpted in an energetic pose that shows off her playful personality for fans to enjoy. Both Takane Shijou and Chihaya Kisaragi are also scheduled to be joining the 'Y-STYLE' series of yukata figures soon, so look forward to them too! Preorders are welcome to ship in late May 2015. When Wayne Newton (a noted Las Vegas crooner) performs on stage, he has a move where he points at no one in particular in the audience. No one knows why he does it. He just does.